Taming the land came at great price. Will their love survive the loss? It has required long, difficult years to tame the virgin prairie of Dakota Territory, but in spite of heartache and back-breaking labor, the hardy immigrants recognize that God has been with them every step. What was merely a dream is now beginning to take shape. And so they face the challenge of proving up their homesteads and building an official town for their growing community. Hjelmer travels west to work on the railroad, but after sending only one letter to Penny, who has agreed to wait for him, he is not heard from again. As the months pass, Penny is pursued by other eligible suitors, and her love for Hjelmer is sorely tried. Will he return to keep his promise? First the land, then a natural disaster nearly devastates them. What will it take to make their dreams a reality? - Publisher LAURAINE SNELLING is an award-winning author of fifty-plus books, including her beloved series Dakotah Treasures and Red River of the North. She also writes for a wide range of magazines and teaches at writers' conferences across the country. She and her husband make their home in Tehachapi, California. 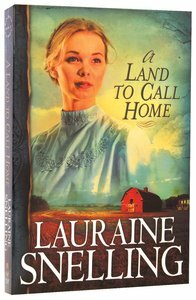 About "A Land to Call Home (#03 in Red River North Series)"
LAURAINE SNELLING is an award-winning author of fifty-plus books, including her beloved series Dakotah Treasures and Red River of the North. She also writes for a wide range of magazines and teaches at writers' conferences across the country. She and her husband make their home in Tehachapi, California. Lauraine Snelling is an award-winning author of over 50 books including The Healing Quilt, The Way of Women, and Saturday Morning. The recipient of the Silver Angel Award and a Romance Writers of America Golden Heart, she also writes for a wide range of magazines and teaches at writers' conferences across the country. She and her husband make their home in Tehachapi, California. With back-breaking labor they made a life on the prairie. When a fire nearly destroys all they have worked for, will their faith remain steadfast? Red River of the North book 3. A Land to Call Home continues the Ingeborg Bjorklund saga as her family works the land and builds a community. Through heartache and back-breaking labor, Ingeborg knows that God has been with them every step of the way. But when a fire nearly destroys all they've worked for, will their faith remain steadfast? (Red River of the North - Book 3) LAURAINE SNELLING is an award-winning author of fifty-plus books, including her beloved series Dakotah Treasures and Red River of the North. She also writes for a wide range of magazines and teaches at writers' conferences across the country. She and her husband make their home in Tehachapi, California.